In addition to providing reduced dimensions when compared with conventional scotch-yoke actuators, the CQ’s symmetric design also presents a perfect weight balance on the valve, enabling increased efficiency for assembly and disassembly. 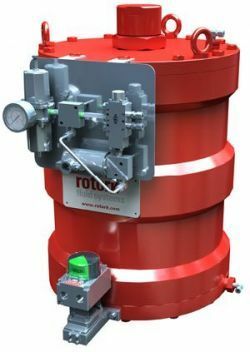 The totally enclosed, rugged CQ weatherproof housing contains a helical mechanism which transforms linear piston motion into 90º (+/-5º) rotation for the operation of quarter-turn valves. As an option, rotation can be increased to 180º. Complete customisation of the torque profile is available to suit individual valve requirements. The CQ range features a choice of cylinder sizes and different actuator builds for many diverse applications. In all cases the CQ design incorporates the removable valve adaptation within the overall dimensions for maximum compactness and actuators can be easily and safely disassembled to access internal parts for field maintenance. Internal coatings provide enhanced corrosion protection for long term reliability. External epoxy finishes and a wide choice of seal materials can be specified to meet industry and customer requirements. CQ Compact actuators are available for single or double-acting operation with output torques up to 600,000 Nm. Pneumatic operation is available using instrument air, nitrogen or clean natural gas at 12 barg pressure, whilst 210 barg is recommended for hydraulic operation. Environmental and hazardous area certifications include IP66M/IP68M, PED, ATEX, IECEx and GOST. The actuators are also suitable for SIL3 safety related duty. The standard operating temperature range is -30ºC to +100ºC providing suitability for applications in harsh and challenging environments, with an optional low temperature limit of -60ºC. Find out more about the CQ range compact actuator.